The impact of electric vehicles (EVs) on logistics in the automotive sector will be immense. The problem is that nobody is quite sure just how immense. Speaking to logistics managers at the Automotive Logistics conference in Bonn this week, it is clear that the level of confusion is substantial. Basic operational issues around handling both finished electric vehicles as well as the batteries themselves confront logistics managers who are only equipped with the tools to manage conventional internal combustion engine cars. For example, finished vehicle compounds are now faced with the problem of having to ensure that hundreds of EVs have their batteries kept sufficiently charged over the several days or weeks they are being stored. Even with present volumes, this is a burden on the power supply infrastructure into these facilities. With sales of EVs climbing quickly, the implication is that the need to sustain the batteries of tens of thousands of cars may demand heavy investment in such locations. The difficulties of the aftermarket may be even greater. Batteries are still classed as dangerous goods resulting in demanding handling requirements. Their transport and storage issues may be manageable in and around a production facility, however within car dealerships the problems are substantial. At present, battery packs weigh 400-500 kg, meaning their maintenance requires specific materials handling equipment. Storage is also problematic, with battery packs having to be held at a minimum distance from each other in order to reduce the risk of fire. Dealerships may possibly have to invest in large dedicated facilities for holding battery packs. This is in addition to the high cost of moving individual packs to dealers by road. Another issue is that of packaging. At present there is a jumble of differing packaging designs that makes both the movement of batteries more complex, especially the business of the recovery of batteries for recycling, something that will become essential. Yet these are only operational concerns. 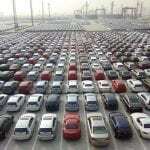 The bigger issues are concerned with the extensive redesign of the automotive supply chain. Strategies for sourcing materials, components and battery packs is a now a real concern for the vehicle manufacturers. They appear to think that the emerging ‘electric-propulsion’ supply chain will be geographically extensive, with certain materials sourced at an intercontinental level, though battery packs will be assembled at a regional level. This will require a generation of new specific transport solutions very different from the truck-based operations in place today. Such is the magnitude of this question that it is likely to have a powerful impact on the choice of location for final vehicle assembly in the not too distant future. The automotive supply chain is being redesigned. By the end of the next decade it is likely to become unrecognisable from what exists today. Logistics solutions will have to not so much adapt as to start from scratch. Please create a password to join our logistics briefing network. This will then enable you to login (top right) and read all of our briefs and whitepapers in full.